DIYing your own industrial fab speakers is easier than you'd think. Designer Sarah Pease shares how in this incredible DIY mason jar transformation. 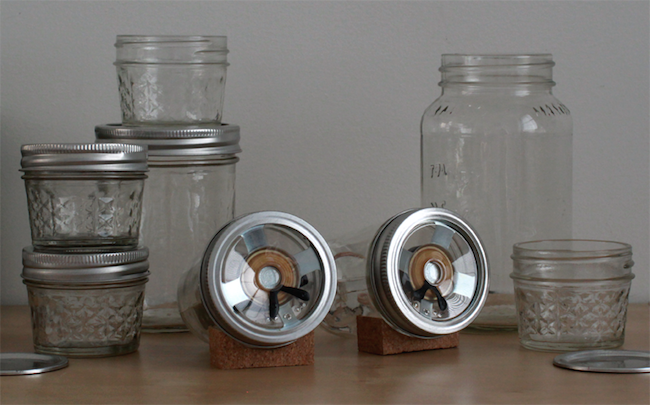 The humble mason jar can hold nearly anything—including tech gadgets! 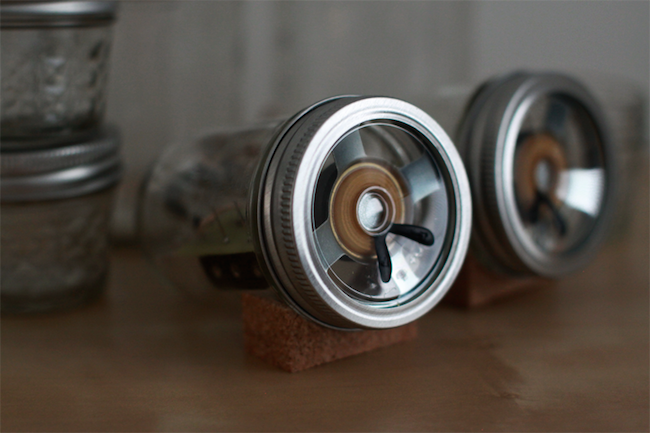 Designer Sarah Pease converted these canning jars into a set of iPhone speakers using David Mellis’ open-source Fab Speakers design files. The results are incredibly stylish. 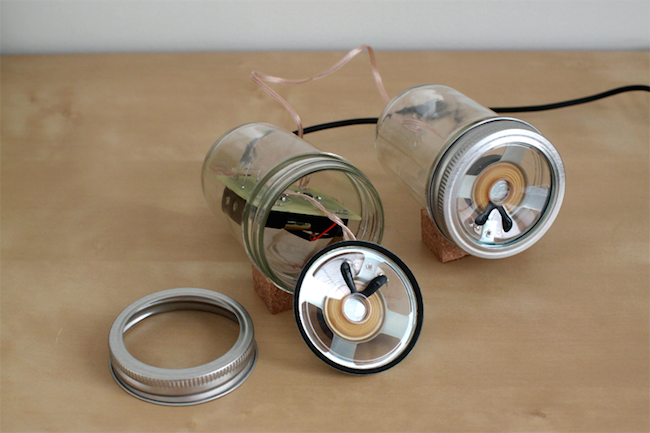 Using David Mellis’ documentation for Fab Speakers, solder together the electrical components using a soldering iron, making sure the speakers will fit into your jar—the 66 mm speakers should fit a small mason jar. Alternative: Instead of creating your own, you can hack apart existing speakers. These days, you can usually find cheap portable ones that will work perfectly. Now, drill your holes into the bottoms of your mason jars—a diamond drill bit will do the job. Take care and be sure to wear protective eye wear before you start drilling. Make sure the glass is wet while you’re drilling the holes—one hole in the bottom of each jar. Note: This is the trickiest part of the assembly. Once the holes are all set, it’s just a matter of putting the electronic components inside the jars. The speakers will fit perfectly inside—hold them in place using the metal bands of the two part mason lids. I opted to use batteries so the only cords coming out of the jars are the 3.5mm audio cable that connects to my iPhone and the wire that connects each speaker to the circuit board. The battery pack is soldered directly to the circuit board, which fits in one of the jars. If you want to make the speaker stand, you’ll need some extra materials. I made the little cork stands by drawing the shape I wanted onto the cork and using a spindle sander to shape it. And voila! 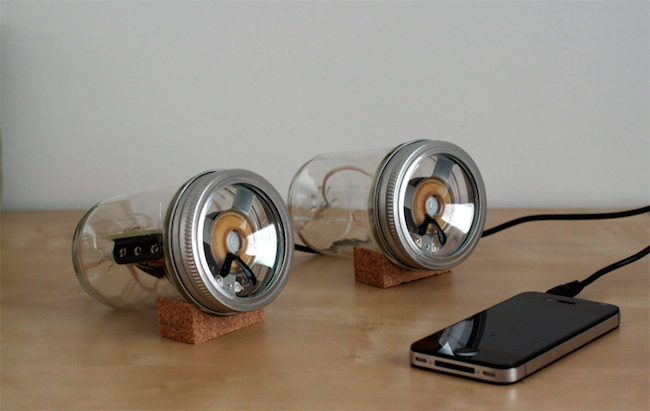 Your very own DIY mason jar speakers.